Failed to select local time? Xamarin studio currently not showing "Datetime.Now" as local time, instead i believe it is showing UTC time. Is this an Existing bug in xamarin studio? Any work around would be helpful . 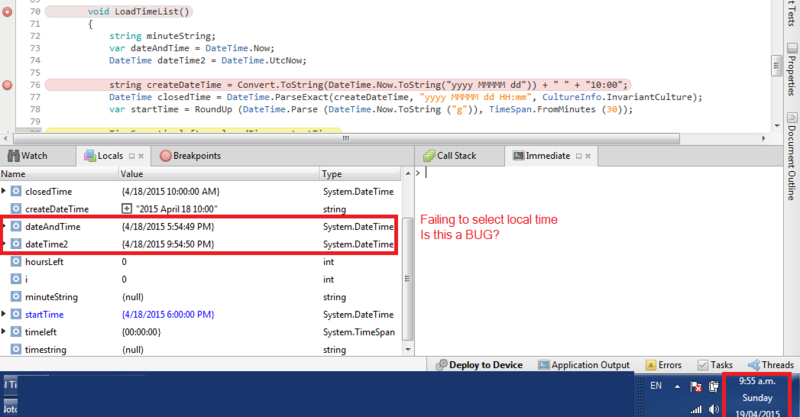 Please see the screen shot for more understanding of the datetime issue. Also, I'm using Xamarin studio 5.8.3 (build 1). Actually I realized that it is using my Emulator time which is different to local machine time. Hence the value in DATETIME.NOW is different. Sorry, Ignore the above question.